Chery drivers posting Chery-related photos of him or his family on social media will win the ultimate award: a trip to China if they are lucky enough. The simple and convenient form of contribution attracted Chery drivers worldwide. As of the deadline, Chery has received nearly 700 contributions and the most popular one got 4,800 ‘likes’, showing the great participation enthusiasm of Chery drivers. 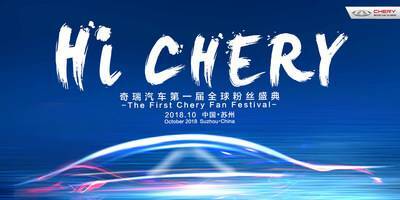 The first Chery Fan Festival, with the theme ‘Hi Chery’, will be taking place from October 24 to 30, 2018. In the one-week trip spanning Shanghai, Suzhou and Wuhu, Chery fans will experience the poetic and picturesque landscape of Jiangnan and the brand charm of Chery. BEIJING, Oct. 28, 2018 /PRNewswire/ — On August 1, 2018, a post titled ‘Chery Global Fan Festival Recruitment’ published on Chery”s social media drew global attention, according to Chery Automobile Co., Ltd.